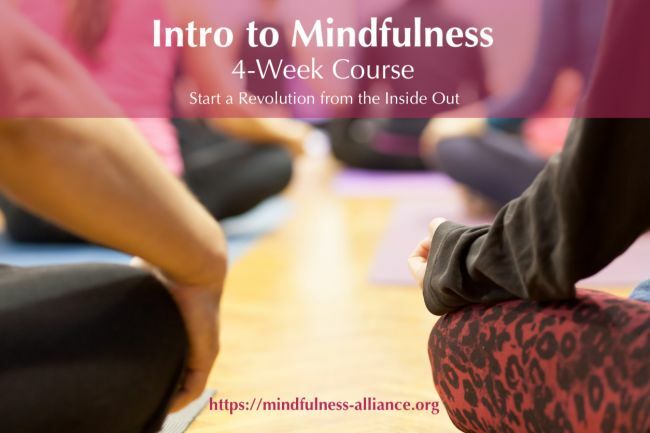 This four part experiential workshop teaches the fundamentals of mindfulness and offers an introduction to many of the formal and informal practices. No previous experience with yoga or meditation is required. Each meeting begins with gentle, mindful yoga to reconnect with the body, provide grounding, and prepare the mind for the stillness practices. Instruction and guidance is provided in several forms of “sitting” meditation, mindful eating, and mindful walking. The attitudes are explored and time for discussion is included. Participants are asked to bring a yoga mat for movement. If you have a favorite cushion for meditation you are welcome to bring it as well. A limited number of loaner mats, chairs and props are available for those who need them. No refunds are given after the deadline for enrollment, which is one week prior to the start of the course (except in the unlikely event of course cancellation by the organizers in which case a full refund will be provided).